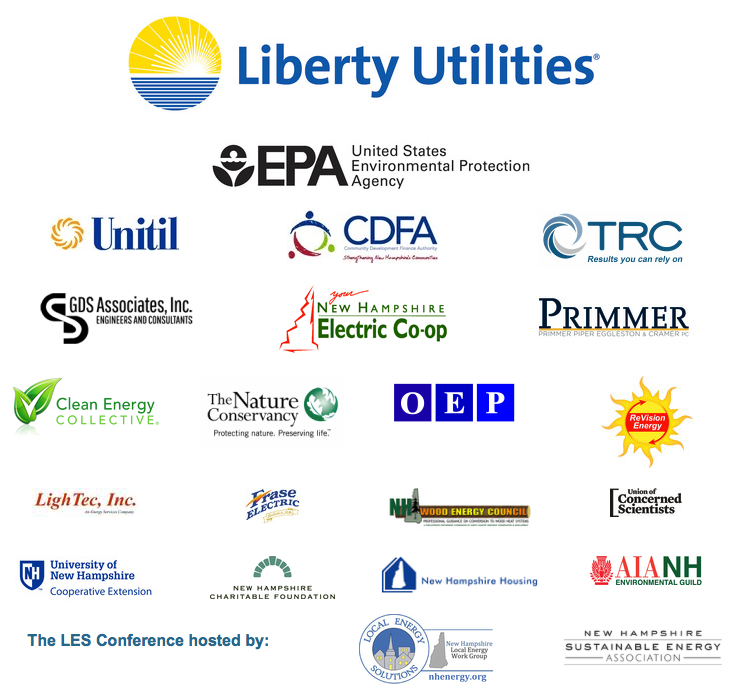 It’s that time of year again – the New Hampshire Local Energy Solutions Conference is March 21. We’ll be there – will you? Register now for this not-to-miss energy conference! Wondering how best to move forward with an energy project? Stumped by R-values and BTUs? Struggling to open your Portfolio Manager account? Brought to you by the New Hampshire Local Energy Work Group and NH Sustainable Energy Association, the annual LES Conference provides critical resources, information, and guidance for individuals, energy committees, local governments, and school districts across the state seeking to implement an energy reduction or renewable energy project in their municipality. The conference provides an ideal forum to meet and learn from other New Hampshire residents who have successfully implemented an energy project, hear best practices, identify financing options, and much, much more. The Local Energy Solutions conference is only possible through the generous support of our sponsors. Solarize Upper Valley Round Two wrapped up on January 31 with 181 homeowners signing contracts to go solar this year – a total of 1,086 kilowatts of new renewable power in the region! What’s more, every community at least doubled its number of solar homes. Congratulations and thanks to the dedicated volunteers and partner installers who made the program a success. Solarize Upper Valley Round Three launches publicly in June. We’ll host an Info Session for Communities from 5:30 to 7 pm on Thursday, February 19, at the Montshire Museum of Science in Norwich, Vermont. Check our calendar or email Sarah@VitalCommunities.org to learn more. Our annual Roundtable is one of the highlights of my year. Free dinner, good friends, and people from all corners of our region who care about local energy. Is there anything better? This year’s annual Upper Valley Energy Committee Roundtable will take place Tuesday, April 28, 5 to 8 pm in the Porter Community Room at the Montshire Museum in Norwich, Vermont. The change of location this year is due to the growing interest in and attendance at this great event. The Roundtable is intended to assist existing Upper Valley energy committees in carrying out their work by sharing information and providing networking opportunities, and to help those interested in forming new energy committees. The Roundtable is free, and a light buffet dinner will be provided. We’ll be posting a full agenda and accepting RSVPs soon, so stay tuned!